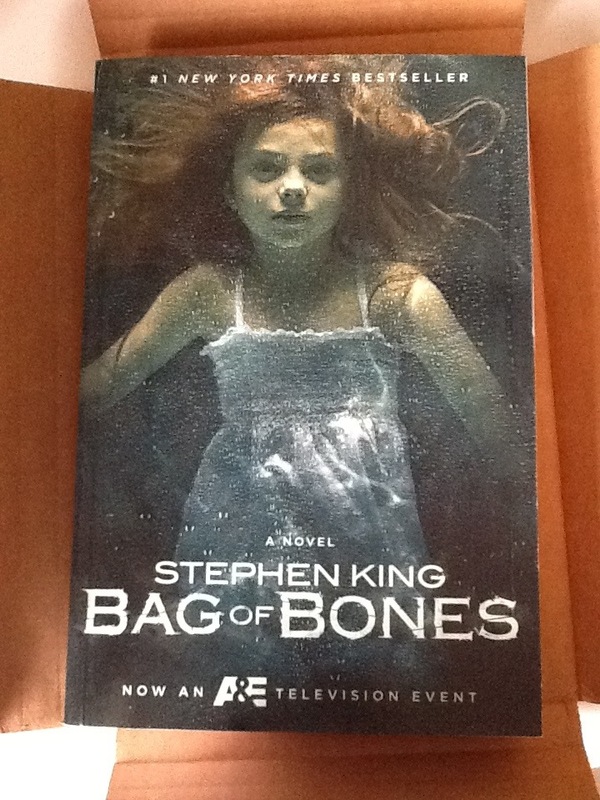 Over the weekend I received my second Klout Perks package: a paperback copy of Stephen King’s Bag of Bones (either from publisher Simon & Schuster or A&E who are adapting the book for TV). I’ll do a few “unboxing” pictures, a disclosure and then some thoughts. Klout will never sell or give away your contact info. participating (or not participating) will not change your Klout Score. As it should be, otherwise it’s payola. You are receiving the product because you are influential and have authority on topics related to the product. You are welcome to tell the world you love the product or say nothing at all. A lot to unpack here. First, it’s nice to know I have “Klout” but I wish I was told what topic(s) were used to screen me. I don’t think my love of Muppets or Atlanta (as reported by the +K I receive through the Klout site) are the drivers here. As for telling folks: what if I HATE the book, the show, or BOTH? If you decide to talk about the product, we will ask you to disclose that you received a sample (klout.com/perks/disclosure). Great news for transparency here and I’ve been totally up front. 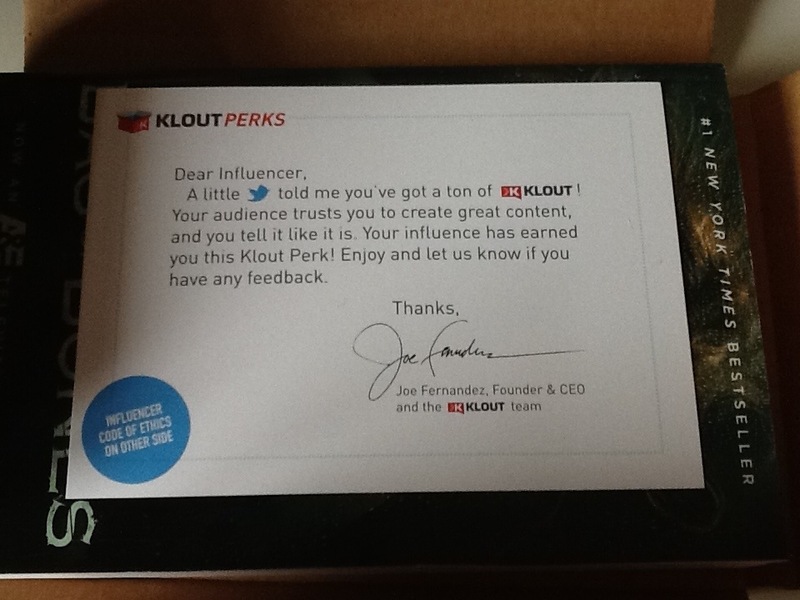 My disclosure/caveat is this: my employer has utilized Klout in the past. I did not work directly on those campaigns but I have met with some of their team. 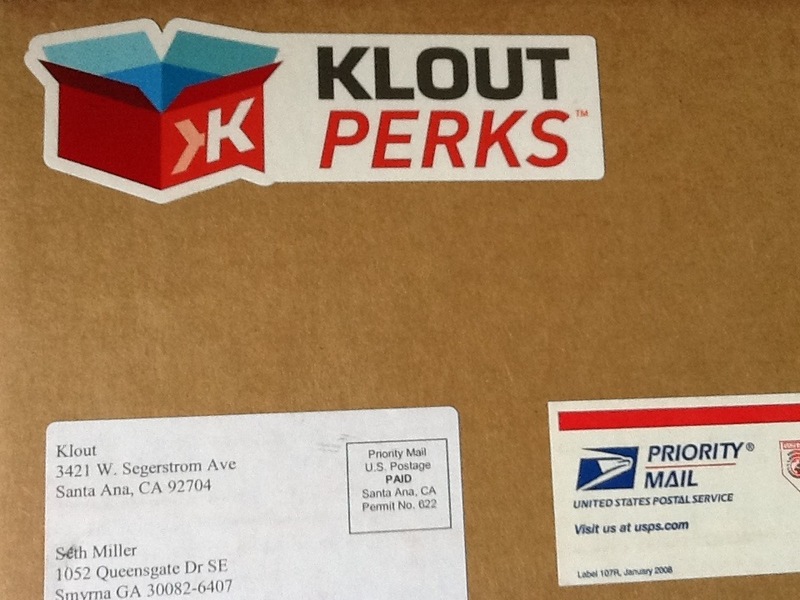 I’m being a bit facetious when I say I don’t know why I was picked for this Klout Perk. First, I signed up to receive it when offered via email and second, I’m sure it has much more to do with my blogging/tweeting about TV than my middling membership in Goodreads. Did the perk work? Is it sufficiently targeted? Seriously though, this is the 2nd perk I’ve received (out of 5 offered) and it feels like the first true “hit” both in terms of targeting and I terms of successful conversion. I’ve only ever read one King novel and I rarely, if ever, watch A&E but the barriers to entry and cost to sample are low so I’m likely to read and watch – at least for a chapter and episode, respectively. I won’t mention the other offers that were emailed to me or the other offer I chose not to blog/tweet about, but I’m curious: is a 20% conversion rate bad? 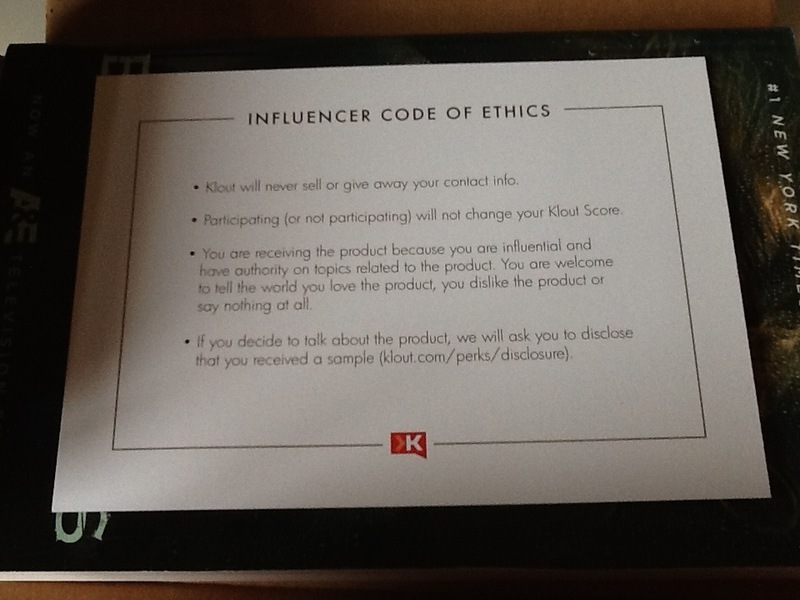 Judge it as I’ve blogged it: is Klout good, bad or indifferent? Until then I’ve got some reading/TiVo’ing to do. Aside: the entirety of this post was written/photographed via iPad which is a first for me. As an initial caveat, I’d like to start off by saying that I am not an “Agent” of Ford’s Fiesta Movement, I’m just someone who has seen the promotion/activation/campaign and been pretty impressed by the use of social media. Here’s the second caveat: I’m an avowed Mimobot nut. Check the archives. Ever since I got my first Mimobot at SXSW earlier this year I’ve been obsessed with amassing a larger collection. So when I saw that Mimoco had created a Mimobot specifically for the Fiesta Movement, I knew I had to own one. Wanna see how it was designed/developed? There’s a video for that! Enter eBay and the very nice (and prompt) Rigel Celeste. She runs a tight ship: courteous, friendly and quick to mail items once the PayPal went through. I gave her five-star feedback for the sale and a follow on Twitter, since she seems so cool. Of course, I was helped out in the process by clusterflock. Great eBay buying advice. It came loaded with four pictures of the Ford Fiesta but was otherwise empty. I believe it was given to Rigel at a Fiesta Movement event, but she already had one. Still, as a giveaway it’s pretty clever, especially since the Fiesta has a USB port. You should check out Stammy’s extensive Fiesta coverage, from an agent’s perspective if that’s your bag. He’s a local Atlantan and technology blogger. I promise not to get all gushy and weird about any future eBay conquests (no, I don’t actually) but if you know of a source for any of the HBO promotional Mimobots, I’m all ears. Which is to say I love beer. Would marry it if that didn’t violate my current nuptial status. I’ve even just had a nice jolt of dopamine by hitting the “save draft” button while editing this very entry. Clearly, I’m in desperate need of Mmmm, Beer [hear Homer say it: mp3]. What got my beer tooth tingling was a particularly tasty cask ale – Saint Arnold Elissa IPA – that I drank at Ginger Man in Austin, TX during SXSWi. The beer got me thinking about cask ales and drinking good beers regularly (apart from the all-too-seldom Monday Night and the stash in the beer fridge) at places local, knowledgeable, inviting and well-stocked. My normal haunts have rotating selections – places like Taco Mac, Varner’s and Smyrna World of Beverages – but I feel like I’m doing a disservice to beer-drinking by not branching out enough. Garrett emailed me about the grand opening of Hop City Craft Beer & Wine at the new 5 Season Westside this Thursday, April 2. So now I have a conundrum. Go drink some free beer and eat some free food at a beer establishment on Thursday (and hang out with some very cool, like-minded folks) or do I go the Social Media Club Atlanta meeting at Manuel’s and do the same thing in a different venue with different folks? I know, I know. Rough life, huh? I think I’m leaning heavily towards the grand opening, only because I saw some of the Social Media Club folks in Austin and I’d like to sample the new wares/digs over Manuel’s (which I already know/love). Worked like a charm @ SXSWi and I managed my (over)indulgences. A beer rating social network that ties in nicely to OpenID and my other social accounts. I’ve been looking to jump ship from RateBeer to BeerAdvocate for some time (damn you, locked-in ratings!) but I’m giving this the old college try. No self-respecting beer snob should leave home without a copy of the rules. Since I’m cobbling together a big beer post, it’d be great if folks wanted to vote in the AJC/Evening Edge’s 2009 Beer Bracket Final Four for the best IPA. It’s down to the Final Four and Atlanta’s own Sweetwater IPA is in the running, having already captured the judges’ votes and looking for a win amongst readers. And if you’ve got a few seconds more in your day to devote to beer-related clicking, take Monday Night Brewery’s survey [via JohnMcNicholas]. Until Thursday, drink a beer for me. I might as well jump on in, since everyone else has, regarding the new “social” makeover of Skittles.com. I’m not one to talk about my day job here, but I have a little bit of experience in the social media space, just don’t call me an “expert”, “maven” or “guru”. I start hearing Carly Simon when people bandie about those terms. Other folks – Dave Armano, Buzz Marketing Daily, Remco Kroes, Dale Larson – and media outlets – AdAge, MediaPost, AdRants – have done the best job of recapping and providing thorough insight, so I’ll just ask a few questions. What was the goal of this campaign? Conversion to Facebook friends? Gross number of “tweets”? YouTube video views? Publicity/Press? My guess is the last one. I think the rest is just gravy and not the point of taking your entire brand to a “crowdsourced” model. Will the redesign affect sales and should it be judged against such a “hard” metric? What am I supposed to learn/glean/experience from the redesign? That some folks really dig Skittles enough to blog/tweet/photograph Skittles? That Skittles has a branded YouTube channel? (Big woop! Who doesn’t? That they don’t have their own Twitter account and encourage the use of a lame web-based feedback form. I can’t believe I’m saying this actually, but where is Skittles in this conversation? What do they want of their customers? What are their expectations? Do they want us to buy more? Eat more? Tweet/blog more? Where is the connection to a contest or sweeps where I get free Skittles if I take “x” action, where “x” is something social? Where is Skittles telling us how much it loves us/hates us/is ambivalent towards us? I’m really baffled by the long-term prospects of Skittles in the social space and I’d love for them to prove me wrong. They’re not a Zappos or Dell or H&R Block (sorry for all the Twitter examples) or any number of companies who use social media to energize, engage, converse and grow with their customers. I suppose people who like this sort of thing – and maybe even Skittles themselves – would say that it’s really the customers who were always at the heart of the brand. I say that what would really make me involved, make me buy Skittles, eat Skittles and regularly tweet Skittles, was knowing that I was really involved in their brand and not just a sideshow act in a social media circus tent. But what do I know? I’m blogging Skittles where before I wouldn’t have. But I’m still disappointed. Comments welcome and encouraged. Tell me how/when/where/why I’m wrong. There’s a thread here, but I don’t want to be too obvious about it. You be the judge. I enjoy Brian Cranston, AMC has me hooked on Mad Men (we started late, but caught *that* marathon) and, despite the Twitter kerfuffle, I think their broadband offerings/extensions are cool. Or they do grok it, just not *enough* or in the right way. Everyone is equally guilty, but folks are trying. Minus the TV, of course. *This* is how the internet changes everything. Found via Twitter, of course. Good advice for folks who peddle Social Media wares and those who would hire them. Not all that shocking or earth-shattering considering the most recent strike (plus some of the factors above) but a good perspective on the shifting. Church of the Customer is always good. I’m remiss in my tweetup and APWBWGTTD attendance.